Based on crunchyroll's description I was afraid this was going to be something I've already seen many times before. Yokai and excorists animes are pretty common these days. This aime isn't earth shakingly good, but I found it entertaining and the show still managed to throw some curveballs. Overall, I was pleasantly surprised by The Morose Mononokean. The plot centers around first year high school student Ashiya Hanae who becomes posessed by a fluffy-cute-looking-but-soul-sucking yokai. After spending his first 5 days of high school in the nurse's office, he finds an assistant-wanted ad for an exorcist. He calls the ad's number, hoping to get an exorcism. Through various means, he meets the exorcist Haruitsuki Abeno, who does exorcise his yokai, but also cons him into working for him. So to pay off his debt Ashiya works for Abeno-san helping him excorcise yokai. From that plot description I'll admit the story sounds pretty average/sterotypical. What I loved about this anime is the Alice In Wonderland feel in a slice of life comedy. This is a fun, light, and feely anime. It makes you smile and laugh, and changes your view of yokai along the way. This anime reminds me of a more comedic version of Natsume Yujin. It's more episodic in nature, than following an overarcing plotline. However there's just enough mystery behind the characters for the viewer to want to watch the next episode. If you're looking for intense epic fights, or looking for a replacement for Blue Exorcist, this probably isn't the anime for you. But if you're looking for a light, fun adventure to see yokai/underworld I would reccomend this anime. I'm definitely going to keep watching. We've all seen 'random high-schooler can see magical creatures' animes before. And, I don't necessarily think this one is particularly creative, or original, or does much to expand/transform that trope. However, I'd also argue that it doesn't need to. The Morose Mononokean is very entertaining. I read through the entire manga collection in one day. The characters are likeable, and develop steadily and naturally (at least in the manga, hopefully the anime follows that pattern). And, while the plot is fairly episodic, there's obviously something larger at work that's just interesting enough to keep you wondering what's going to happen next. So, in general, if you're looking for something new and exciting, this anime/manga might not be it. But, if you're just looking for something cute, fun, and entertaining then you've found it. From the start the show displays some very nice animation and a good idea of how it wants to approach the rest of the series. The comedy is very lighthearted and there can be some heartfelt moments that derive from some quirky antics that the show presents. The first episode jumps right in and provides only a little bit of insight on whats going on the world. Where, although it is tackled nicely as it progresses, can be a little bit of a turn off for some by not having enough character development from the start. The anime is very reminiscent of noragami, but being a little more lighthearted and more centered around comedy and a bit of slice of life. So far I've been enjoying it, but it might not suit everyone's tastes due to it not involving a whole lot of action or rivalry. The anime show has well-paced episodes, a kawaii characters, and the show creators gave the watchers a mysterious underworld and characters that we have more to learn about. (FYI the underworld looks like the exact opposite of how I expected it to be which the show flaunted it's original ideas). I like that the basic concept of a student in high school with magical creatures was made to be totally original with real world problems which interested me even more so. I kinda want something to really happen! It is cute but it needs more dept with darker colors and shock me with different characters. It is fine. I like the old timy way of drawing the akumas, but I wanted to see more scarier monsters. They are all just kinda cute. Some of them could be cute, but some of them could be really scary at first and then turn out kind. I wanted to see mode difference between the characters. I have seen these so so many times. BORING!!! Make something happen already! I wrote this after seeing the 6th episode so I might just be a bit to hasty with my review, but for now I am bored. 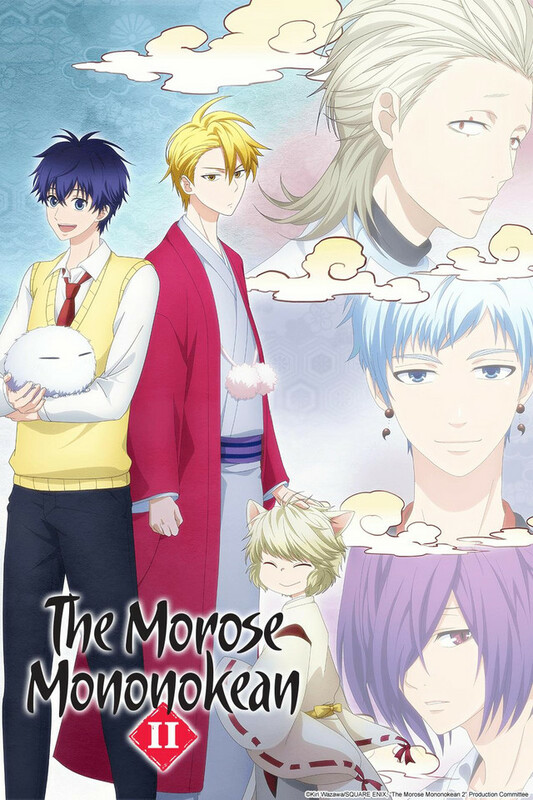 I would say that the morose mononokean is not the best that can be produced from this genre but it's still an enjoyable, light hearted anime to watch. The characters are okay, the scenery is pretty cool, and there isn't much of a plot. If you just want something kind of going in the background then this is a good choice. This show is pretty delightful! Normally I follow multiple shows and I tend to keep a "romantic" anime in the back there to satisfy a need to watch people make long lasting relationships (and blah blah blah) but this is SO MUCH BETTER. All the characters, from the two main characters (Ashiya & Abeno), to the yokai, and the others that have made an appearance, are so delightful! Every episodes so far has had AMAZING pacing. They do not leave anything hanging or unresolved. Aside from maybe a teaser here and there. The art is fantastic!!! Really, just for that, watch episode one! Does it have an original plot? Well you can argue that, BUT they deliver it so well. I definitely think it's a twist to the usual Yokai Exorcism story. Normally you'd have clueless school girl trying to figure this out, but they deliver this with a great, charismatic, strong, hopeful and cheerful HS BOY! Change of pace, The Morose Mononokean. The Morose Mononokean is definitely a nice change in pace from the usual yokai related anime. In my mind it is comparable to Flying Witch in this regard. The main character Hanae starts out as an everyday first year high school student, with one catch, he has been what he comes to first believe, is a “victim” of a yokai possession. It turns out to be a misconception on his part and with an exorcism from Haruitsuki Abeno, another student at his school, his world changes. Possibly for the better, we have yet to see. Overall I have enjoyed the first three episodes, and look forward to what happens in the future Hanae. Ep1 Review - Love me some yokai! I love anime that include youkai in the real world and the humans who interact with them. It's a decent start, a semi-quiet, pretty anime with a nice premise that holds some promise. Not overly impressed with the (two, so far) character themselves - they seem a little stereotypical - one dimensional - thus far (the grouchy omniyouji, the goofball/potentially incompetent student assistant, the oddball/clueless parent), but hopefully in future episodes we'll get some character development. It made it to my queue, let's see if the storyline keeps it there. Love This Anime and so Should You! I've only read a few chapters of the manga and when I saw the first episode of this anime I just couldn't stop smiling. It's beautifully adapted and the quality of the anime is very good. I really enjoyed how the managed the comedy aspect of the manga. Some anime shows just don't do that properly and just start off badly. Also the fresh take on exorcising youkai is very profound. I am officially hooked with the Morose Mononokean and highly recommend you watch the first episode. I can guarantee you won't regret it!